Save Big $$ Making Your Own Dog Toys! Learn How To Keep It Safe! Turn Trash Into Hours of Fun! Have Fun On A Budget! Teach Your Kids The Value of Making Things At Home! What a Great Idea, I easily spent over $100 in Dog Toys this Year. This could save me a bundle! Thank you so much. This book is terrific! My mother and I are doing a church fair table selling pet toys so this will give us some great ideas! As a pet owner, you get to offer some acceptable solutions to this natural process, hopefully deterring the teething pup away from the more unacceptable items. Nonetheless, the pup will choose something homemade over something store bought because the smell from store bought items are nowhere near as appealing as items already in the home. Making HomeMade dog toys is COST-EFFECTIVE, imaginative, and down right fun. Almost anything in the home has the potential to be a dog toy, and believe me, your dog is well aware of this fact. When bored, your favorite cushion sure will feel good on those teething incisors, and the smell is simply wonderful! Those curtains hanging there sure do move nicely and make this interesting sound, and your dog will thoroughly enjoy finding out what is making that sound. Let's face it - your home is a cornucopia of interesting smells and sounds with everything you hold dear having the potential to be an enormous dog chew. Instead of allowing your best friend to envision your belongings as a favorite new toy, or an adversary needing to be ripped to shreds, pet owners offer special toys to their dog. This is how a dog learns what is an acceptable opponent, and what is not so acceptable. Making homemade pet toys is an ideal method of allowing your dog the benefit of personal scents you naturally add to the homemade item instead of the sterile or mixed scents of those store bought items. of a Dollar and Inspire Them Creatively! HERE ARE SOME OF THE TOYS YOU'LL MAKE! 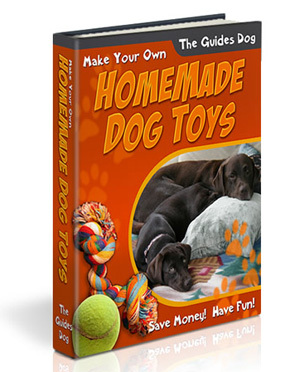 For less then the cost of one dog toy you can download all these guides, and start saving money today. To get started click the Add to Cart button below. You'll be taken to Clickbank for processing and then follow the prompts to register for our download area. Processed Securely via Clickbank, the World's Most Trusted Digital Marketplace. ClickBank will, at its option, replace or repair any defective product within 6 Days from the date of purchase. After 60 Days all sales are final.